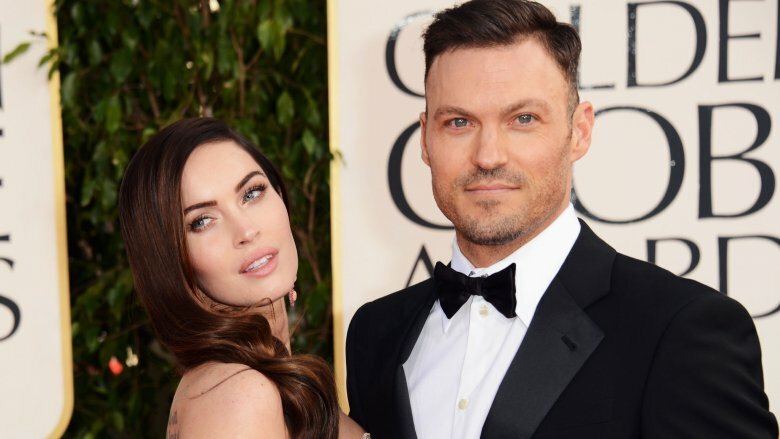 When Megan Fox and Brian Austin Green secretly wed in 2010, they were coming off of a rocky six-year relationship that had already seen its share of ups and downs in the spotlight. Their marriage hasn't gone smoothly either, and immediately after tying the knot, many people were wondering if their union would even last. They've certainly beat the odds, and these two added three children to their brood to accompany Green's son from a previous relationship. However, their growing family has also added some strain for the couple, as well as conflicting ideas about gender roles within their marriage, cheating allegations, and Fox's admission that things are far from peachy-keen in the Fox-Green household. Resentment reportedly pushed her to the brink of divorce, only for her to be sucked back in by a surprise pregnancy. Yup, this relationship morphs more than a Transformers action figure. There's never a dull moment with these two. 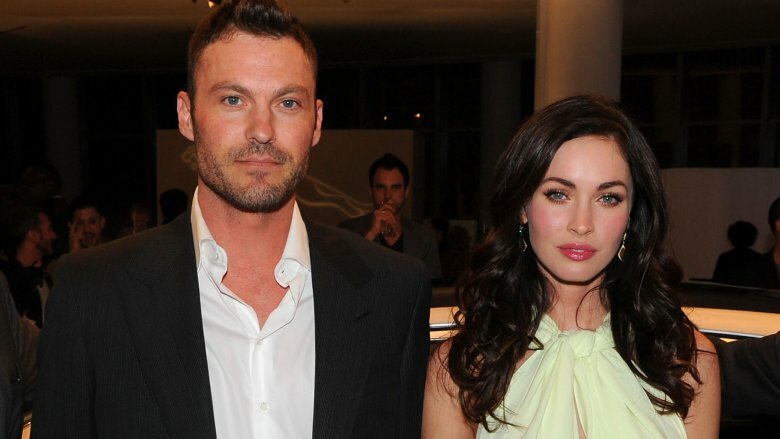 Here are all the strange things about Megan Fox and Brian Austin Green's marriage. 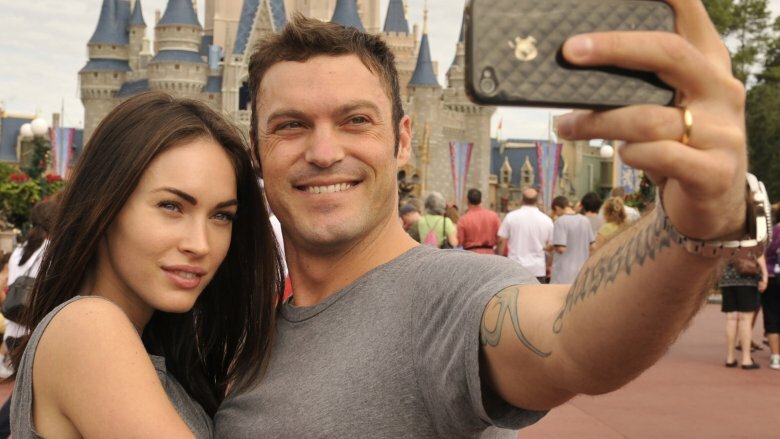 When Megan Fox and Brian Austin Green met on the set of Hope & Faith in 2004, she was only 18 years old and had just started her acting career a few years prior in the Olsen twins' movie, Holiday in the Sun. Green, on the other hand, was already 30, a father and an actor whose glory days on 90210 were behind him. Way behind him. Still, she actively pursued him. "I was like, Oh my God, I have to be with you. You're not a threat, you're not some d-bag that's going to cause a lot of problems." she told Elle magazine (and we're cringing already.) Green was apparently reluctant to date Fox because of her age. "I had to convince him that I was slightly more responsible and well-spoken and had other things to bring to the table besides being 18," she said. Somehow, Green found a way to look past the birthday divide, so Fox was successful in that sense. But although age ain't nothing but a number, their age gap still makes many people feel a tad bit uncomfortable. Did she get busy with Sam Witwicky? Megan Fox became one of the hottest actresses in Hollywood after starring in the 2007 film, Transformers, but some unsavory chatter bubbled up about her time with the blockbuster franchise. Her co-star, Shia LaBeouf who plays character Sam Witwicky, told Details (via Us Weekly), "Look, you're on the set for six months, with someone who's rooting to be attracted to you, and you're rooting to be attracted to them." In layman's terms, LaBeouf was suggesting he and Fox hooked up on set. "I never understood the separation of work and life in that situation," LaBeouf said. "But the time I spent with Megan was our own thing, and I think you can see the chemistry onscreen." When asked if Fox and Green were in a relationship at the time he allegedly hooked up with the actress, LaBeouf answered with an "I don't know" more than eight times before adding, "It was what it was." Yeah, he doesn't sound guilty. At. All. We don't want to assume that Fox cheated on Green prior to their 2010 wedding, but LaBeouf's convoluted answer leads us to believe that maybe their professional relationship crossed the line at some point. We're over! Now let's get married! Megan Fox found herself fired from the Transformers franchise in 2009 after she referred to director Michael Bay as "Hitler" in an interview — that reportedly didn't sit well with producer Steven Spielberg. On top of that, her relationship with Green had also hit a rough patch, and the two called off their engagement earlier that same year. However, in a surprising twist, Fox and Green went from being estranged to getting married in a private ceremony in Hawaii in June 2010, according to E! News. Considering how fast their relationship went from turmoil to wedded bliss — and, might we add, Green's son from a previous relationship, Kassius, was the only guest in attendance — we can't help but wonder if their families and friends were supportive of their quickie nuptials? As Megan Fox's career continued to struggle, her relationship with the press grew increasingly strained. According to TMZ, a heated exchange between Brian Austin Green and a photographer allegedly escalated when Fox yelled to Green: "Are you going to let him get away with that?" Apparently, that was enough to rile Green up. Bigly. A man standing up for his lady is uber-hot and all, but these two need to learn how to chill before someone really gets hurt. On the flip slide, a couple that fights the paparazzi together stays together, right? Obvi. 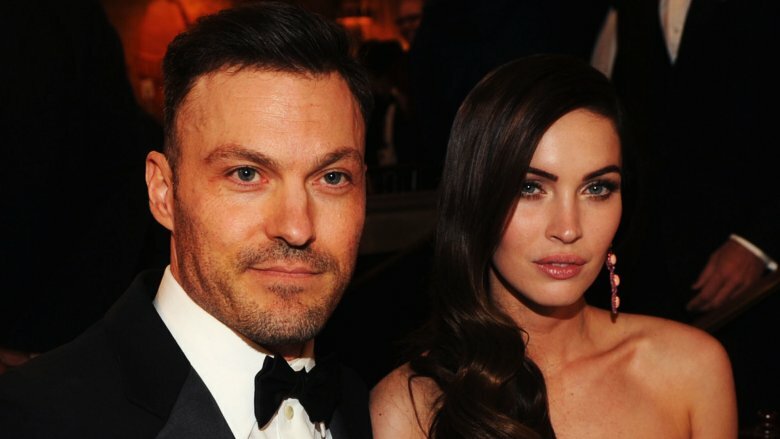 In September 2012, Megan Fox and Brian Austin Green welcomed their first son, Noah Shannon Green, but not before a harrowing car ride to the hospital. "I was screaming for an epidural when [Brian Austin Green] was driving me to the hospital because my water broke on its own and I was immediately — it was level orange alert pain," Fox told Access Hollywood. "It was so intense. And I thought I was gonna be really tough and make it, I was gonna labor to like 8 cm… but the first contraction that I got was horrific!" Despite the excruciating pain, Fox was determined to look her best by any means necessary. "I had wet hair so I was trying to blow dry my hair before I went to the hospital because I didn't want to go to the hospital with wet hair," she recalled, laughing. It's rather odd that she couldn't put her glam routine on the back burner for just one day, no? Then again, it wasn't just any day. It was the day she was set to give birth, for goodness sake! 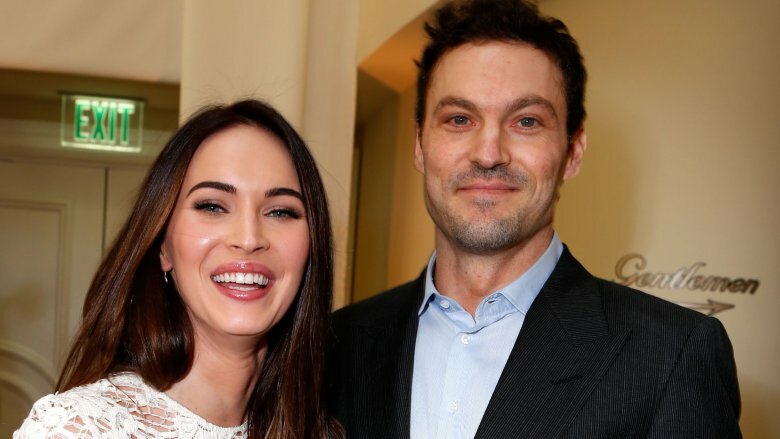 When Megan Fox filed for divorce in 2015, Brian Austin Green was publicly roasted for requesting spousal support from Fox, but the guy had good enough reason to request monetary help from his estranged wife. TMZ uncovered court documents that revealed Green suffered from vertigo and had been unable to work after an accident exacerbated his medical condition. "Brian and Megan were driving when they were hit by a drunk driver who was arrested," the gossip website reported. "Brian says the guy was going around 50 MPH and it was severe enough for the airbags to deploy." The fact that Fox is the breadwinner in their relationship is NBD, but it does make us wonder if she called off the divorce just so she wouldn't be stuck bankrolling his life for the foreseeable future. After her very public spat with controversial director Michael Bay and her termination from the Transformers movie franchise, Megan Fox's career went into a downward spiral. Considering Brian Austin Green's medical condition and sporadic employment, someone had to bring home the Benjamins to support their growing family. That's when the This is 40 star reportedly extended an olive branch to her old Transformers director. "She swallowed her pride, picked up the phone and spoke with him to clear the air and apologize." Radar Online reported. "She told him how thankful she was to have been casted [sic] by him in the first place, and that she was totally out of line to say what she said." The so-called plan worked perfectly. Bay cast Fox as April O'Neil in the Teenage Mutant Ninja Turtles reboot and announced on his website: "TMNT: we are bringing Megan Fox back into the family!" It seemed like things were looking up, but Fox would soon figure out that being a working mom could wreak havoc on her marriage. In August 2015, Megan Fox filed for divorce, citing irreconcilable differences, reported Us Weekly. Some sources said the issue was Fox's career. "Megan worked a lot last year, and she continues to work a lot," an insider told People. "When she is away, Brian stays with the kids. Before they filed for divorce, they had disagreements about this situation." 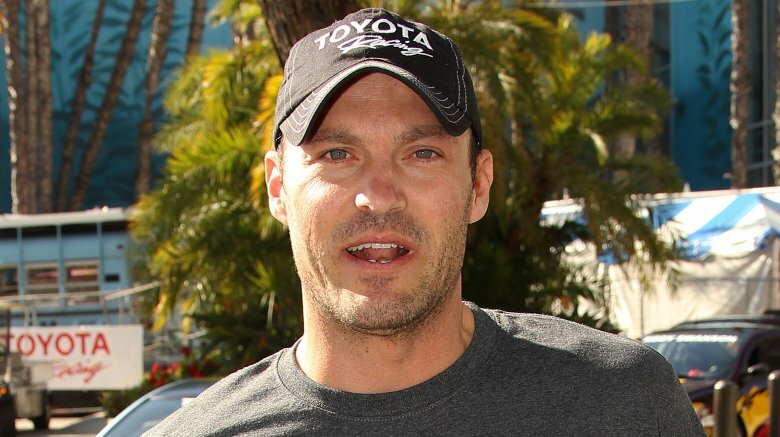 A frustrated Brian Austin Green allegedly wanted "another life than just being a dad." However, even after Fox filed for divorce, the couple continued to be photographed and were reportedly dedicated to maintaining a stable home life for their sons. Okay, so let's recap what the rumor mill has told us: He supposedly needed her to financially support him, but he threw a hissy fit when she attempted to earn a living for their family? Ugh. You can't have it both ways, Brian! Brian, you ARE the father! In April 2016, a supposedly single Megan Fox surprised the entertainment world by announcing she was pregnant with her third baby, and for a moment, she wouldn't reveal who the father was, which sent Hollywood into a tizzy. After months of playing coy about the status of their relationship, Fox called off her divorce from Brian Austin Green in July 2016 and confirmed that they were preparing for the arrival of their third child. "During their separation, Brian always hoped Megan would change her mind about the divorce and he is very happy that she did," an insider told People. "They both worked hard to figure out their marriage and things seem great." They wouldn't be the first couple to conceive a child during a breakup (Jessica Alba and Cash Warren, we're looking at you,) but the timing behind this baby's conception is super awkward, don't you agree? After meeting on the set of Hope & Faith in 2004, Fox said she was clueless about the new object of her affection, telling Cosmopolitan (via OK! ), "I didn't know who he was since I was too young for Beverly Hills 90210." This is proof that she didn't fall for him because of his heartthrob status. Instead, she was attracted to him in a much deeper way after that fateful meeting. "But the first time I saw him, I got butterflies. And the first time he casually touched me? There was so much electricity," she said. "I don't want to sound corny or cliché, but I do believe we are destined to live this part of our lives together." She went on to describe Green as her soulmate, and we don't doubt that at all. Only a couple who's meant to be together can emit electricity just by touching one another — unless, of course, somebody doesn't use dryer sheets. Just when we thought this pair was on its way to a lifetime of blissful matrimony, Megan Fox threw a curveball during a 2018 appearance on Hollywood Medium (via People). The show's host, Tyler Henry, supposedly connected with Fox's spirit guides and asked, "I'm seeing green, green, green. Does that mean anything to you at all?" Fox answered, "That's my husband's last name." Um, duh! As Henry dove deeper into the session, he described the past two years of Fox's life as a "recovery kind of feeling." And that's when the actress opened up in a way we weren't expecting. "What I took away from that was this is a time for me to really focus on healing myself emotionally and not unlike my mom, connecting to myself," she said. "Prioritizing my kids and making sure they're okay, and at some point in the future, love will be revealed." Wait, does this mean love hasn't been revealed yet? Isn't that her husband's job to do the revealing? We're all sorts of confused, and yet not necessarily surprised. It's plausible that their past relationship struggles continue to haunt them. 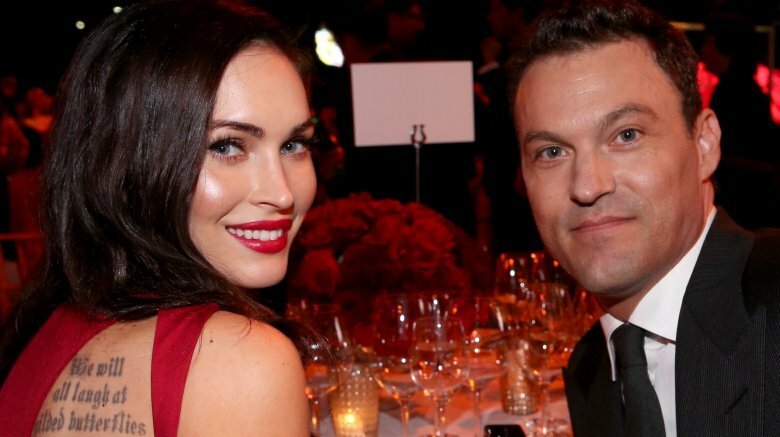 In a 2017 interview with People magazine, Brian Austin Green made it clear that he and the Jennifer's Body star are in it for the long haul. "We fight, we disagree on things. But I don't want to go anywhere and she doesn't, you know? So we stick it out," he said. And he wasn't kidding. By the time April 2018 rolled around, the couple was putting on a united front while frolicking in the sand in Hawaii. Their vacation destination just so happened to be the exact same spot where they got married and honeymooned eight years prior, according to Us Weekly. Aww. How romantic and sentimental, right? And don't be surprised if they decide to add another baby into the mix, as well, and not just because Megan Fox is in the lingerie business. "We've talked about it," Green told People. "I'll leave it at that." Despite their rocky relationship history it's good to hear that these two stars are willing to fight for their marriage…no matter how strange it may be.